The Montessori Method was developed in the early 1900’s by Italian physician, Dr. Maria Montessori. She utilized a scientific approach based on research and observation to develop her scientific pedagogy working with disadvantaged students in a neighborhood. Her educational strategies produced remarkable results. The Montessori environment cultivates a child’s natural desire to learn. 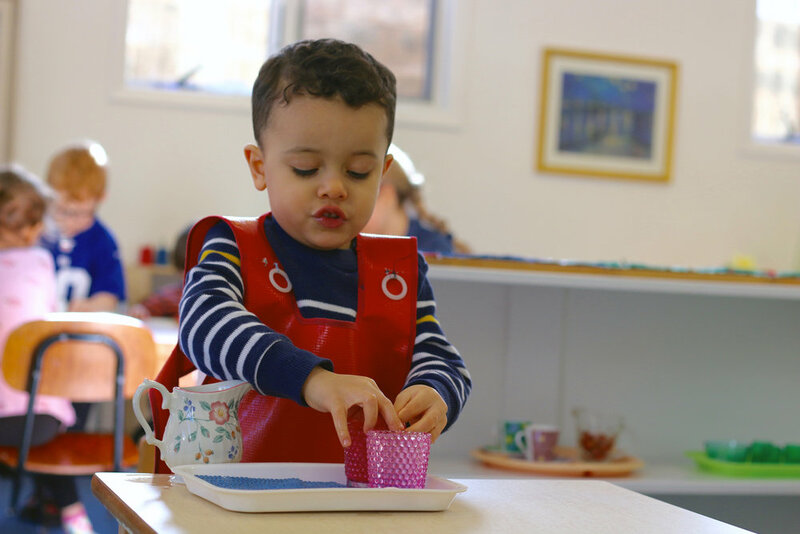 The Montessori Method is a carefully designed, child-centered philosophy and set of learning materials that support and foster each individual child’s independence, curiosity, and passion for learning in a prepared environment. The absorbent mind acts as a sponge and enables the young children to take in information without effort through the use of five senses. The absorbent mind is highly active from 21/2 to six years old which is called “sensitive periods.” They develop intense interest in learning particular skills and concepts. Children have a strong inner motivation to learn in the prepared environment. A developmentally appropriate classroom allows a child to work with materials in a sequence from most simple to complex. The child works with materials at their own pace, repeating an exercise until it is mastered. To learn more about Dr. Maria Montessori and the Montessori method, visit the American Montessori Society (AMS).